"light, holds and casts line nicely even 30# fireline; bail seems sturdy and returns nicely"
"As good as the Catalyst I purchased 8 years ago. Smooth retrieve, long accurate casting, performs well with most lures and rigs. I have not had any trouble with the one I purchased. Have caught a ton of fish with it and it is still going stong." 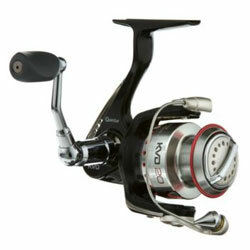 "This reel looks nice and seems to be made out of high quality materials. It casts well and has pretty good drag. "